One of the coolest soundtracks of the 60s – presented here in a massive package that brings forth a wealth of never-reissued music! 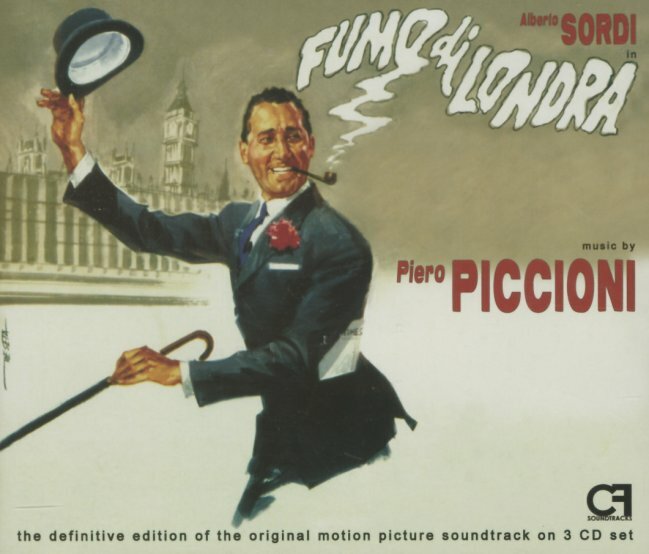 Piero Piccioni really hit his stride for the music to this film that was directed by its star – the effervescent Alberto Sordi – a fantastic send-up on the London scene of the time, set to a range of modly romping tunes! Piccioni handled the main music – often with loads of great piano and organ lines – but there's also some great vocal moments too, sung by Lydia MacDonald, Julie Rogers, and even Sordi – and the record also features a few touches from I Cantori Moderni, and a bit of music from Ennio Morricone too. Titles include the wonderful "Mr Dante Fontana", a nutty groover about the mod fashion scene in London – and it also features the famous tracks "Richmond Bridge" and "You Never Told Me". Titles include a few versions of "Fontana" and "Richmond", plus "Ascot Dream", "Magic Castle", "Tango Walk", "Drag Beat", "This Is Life", "Palace Parade March", "Babylon, I'm Coming", and "His Dream Has Come True". 3CD set features the full original album in both mono and stereo – plus 71 bonus tracks from the film score! © 1996-2019, Dusty Groove, Inc.